What makes this green plant with the bright yellow flowers so appealing as a speciality crop alternative to wheat or barley? Many predict a bright future for this colorful cool-weather crop, and center Pivot irrigators already have a tool to achieve maximum yields. Canola seeds contain from 35-44% oil and about 23% protein compared to about 20% and 40% respectively in soybeans. When the oil is removed from canola, it leaves a high protein (37%) supplement wich can be fed to livestock. It has been an important crop in Europe since the 13th century and as early as 2000 B.C. in India and China, where it was used for fuel oil. It became a valuable crop in Canada during World War II when the oil was used as a lubricant for the steam engines of naval and merchant ships. Producers currently growing small grains have the capacity to easily adapt to canola with only slight modifications in equipment or management. Most good wheat (and barley) growing climates and soils are appropriate for canola production. However, better yields can be expected in areas with cool noght time temperatures and where a limited number of days above 90ºF occur during the July pollination period. Canola can be grown on most types of soil, but it is best suited to clay loam soils that do not readily form a crust to interfere with seedling emergence. The crop is tolerant of soil pH in the 5.5 to 8.3 range, and it responds well in saline conditions. Canola requires good seedbed preparation similar to that for small grains. The growth and development of canola plants can be divided into five recognizable stages: seeding, rosette, budding, flowering and ripening. The total water required by a canola crop varies from spring to fall, year to year and location to location depending on humidity, temperature, wind and light. Canola is considered a cool-weather crop and requires more water than either wheat or barley. The canola plant needs about 0.08″/day of water starting at early seeding stage. 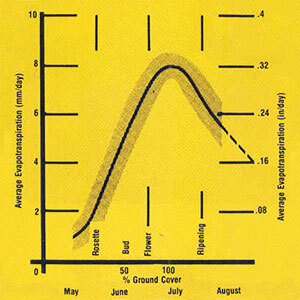 Water use increases to a high of 0.32″/day during flowering, then drops to 0.16″/day through ripening. Although canola responds to irrigation, the plants cannot tolerate standing water or a waterlogged soil. Thus, good drainage and irrigation management are important factors in achieving higher yields. Canola’s future as a major crop option for growers will be determined by several factors, including government programs, canola processing and the continuing demand for canola products. Center Pivot irrigators already have one important management tool to maximize profits from canola.